Flyway is a Convenient Non-Stop Bus Service to LAX picking passengers up from Van Nuys, Union Station, Hollywood, Westwood, Long Beach and the Metro Orange Line bus route. From LAX: You would catch the "Flyaway" bus on the "Arrival / Lower Level" of each terminal. Look for a green sign saying "Flyaway, Buses & Long Distance Vans". They depart LAX every 30 minutes on the hour & half hour daily from 5:00 am to 1:00 am. All FlyAway buses drop off passengers on the Upper/Departures Level at each terminal. FlyAway Van Nuys Parking Rate Increase: Starting January 1, 2019 the parking rates at Van Nuys FlyAway facility changed to $1 per hour, and up to $5 maximum per day. FlyAway Metro Orange Line discontinued: The Orange Line route was discontinued on January 31, 2019 due to low ridership. FlyAway Westwood schedule change: Effective January 7, 2019 the FlyAway Westwood bus schedule changed due to low ridership. Do the FlyAway buses have bathrooms? No, FlyAway buses are not equipped with bathrooms. Are FlyAway buses wheelchair accessible? Yes, all FlyAway buses are wheelchair accessible. Can you reserve a seat on the bus for a specific date and time? No, you can't. 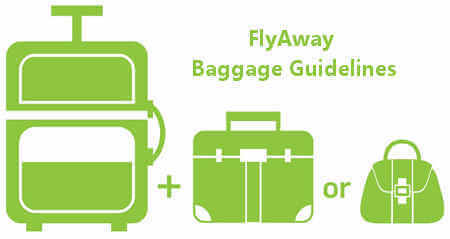 The FlyAway bus service operates on a first-come, first-served basis. Are children required to ride in a car seat on the FlyAway bus? No, a car seat is not required. Parents can choose to hold a child on their laps or opt to have the child ride in the car seat on the bus. Do FlyAway buses offer Internet access and charging stations on board? No, except on the Van Nuys route and Westwood route. Unlike public buses, FlyAway buses are designed with luggage bays and feature cushioned seats. LAX FlyAway bus service is also in compliance with Americans with Disabilities Act requirements. Baggage Liability - Passengers must declare fargile items and sign a limited liability form. Baggage Allowance – A maximum of three (3) stowed bags and/or other type of containers, meeting weight and size limitations specified below, and one (1) carry-on item per passenger. Size – Combined length, width and height cannot exceed sixty-two (62) inches. Weight – Cannot exceed fifty (50) pounds. Sports Items - Must be in fully-enclosed containers no more than ninety-two (92) inches in length. © Socalthemeparks.com All Rights Reserved.